The newly relaunched Yamaha VMAX motorcycle for the 2008/2009 riding season will be arriving at a store near you soon! The new spec of the VMAX is even more striking than the previous versions, with much more of a "bad boy"look! Some reporters have the new model at 200 bhp, but at the time of writing, the info on the new-generation Yamaha VMAX is thin on the ground, so until the specifications have been confirmed, this review is on the 2007 version of the VMAX. The Yamaha VMAX has been pounding the streets since 1985, chewing up the rear tire with pure adrenaline producing power! The VMAX has an old-school design, coupled with new-age technology. Fans of this style love the VMAX for its upright seat position and mid center of gravity, and the ram-air intakes next to the tank make it look mean! Since the VMAX launched in 1984 and on sale since it's been a huge part of Yamaha's success. This bike is well built, so well built that you can still find the 1985 version of the 'Max for sale in your local paper and on Ebay. That's a ral testament to Yamaha and their commitment to produce a bike that would stand the test of time to become a classic. The VMAX has an 1198CC motor and the infamous V-Boost. The V-Boost is a patented fuel system that discharges high amounts of gas into the engine from a variable intake system when the motor reaches 6000RPM and above. Four Mikuni carburetors provide low to high end performance in a really smooth fashion. To To improve the handling the VMAX's gas tank is located under the seat, also providing room for large airboxes positioned over the carbs. A large 6 inch tire in the rear keeps this animal on the road while dual 298mm front discs and four piston calibers on the front and a single 282mm disc rear brakes are needed to bring this beast to a halt, although thinking about it, why would you want to? The VMAX features a seriously strong shaft drive that is very low of maintenance, a la BMW. The Yamaha VMAX is an extremely well built motorcycle that has stood the test of time. Yamaha is making progress and the bike has been seen out and about on the roads in Italy.The tests are a clear signal that the bike is in its final phase before releasing it to the public. 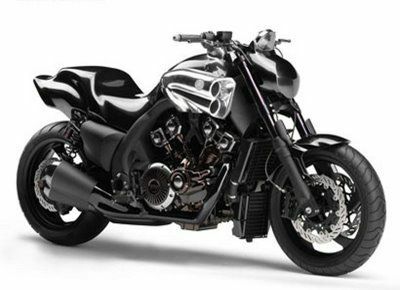 The VMax is likely to be launched as a 2009 Model later this year on the 25 year anniversary of the original VMax.